After five trades down the Dallas Cowboys take . . . another running back. Georgia Tech’s Tashard Choice seems an odd, er, choice, given that the Cowboys drafted a back in the 1st round and have a young Pro Bowler, Marion Barber, on the roster. Still, this is a good value this deep in the draft (the 122nd pick). Strengths: A workhorse back with natural running skills and excellent competitiveness. Reads blocks well, doesn’t waste motion and gets through holes quicker than people seem to think. Patient, does a nice job of locating cutback lanes and makes sharp cuts behind the line if scrimmage. Displays great stop-and-start skills. Runs hard, bounces off arm tackles and picks up many yards after contact. Consistently makes the first defender miss. Shows effective use of stiff arm. Runs adequate routes and has the burst to separate from man coverage. Catches the ball with hands away from frame and doesn’t drop many passes should catch. Is smooth turning upfield and shows good vision setting up blocks in space. Does an excellent job of selling playfakes. Weaknesses: Lacks any elite physical qualities. Is quicker than fast. Lacks breakaway speed and isn’t much of a threat to go the distance when gets a seam. Gets tracked down from behind too often. Lacks ideal size for his tough running style. Keeps ball tight to frame most of the time but doesn’t always cover up when gets into traffic and can put the ball on the ground. Though he flashes a mean streak and a powerful punch when asked to help out in pass protection, he also takes poor angles to assignments and dives at defenders’ feet as a last ditch effort. Lacks ideal lower body strength and struggles to anchor when picking up blitz. Overall: Choice spent the 2004 season backing up Adrian Peterson at Oklahoma. 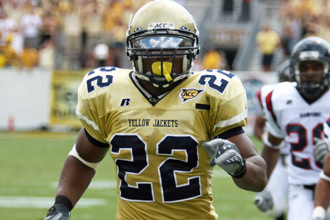 He enrolled at Georgia Tech in 2005 and was immediately eligible to play after the NCAA granted a waiver of the residency requirement. During his next two seasons with the Yellow Jackets, Choice appeared in 26 games (15 starts) and ran for 1,986 yards and 18 touchdowns on 414 carries (4.8 average). In 12 games (all starts) in 2007, Choice turned in 1,412 yards and 10 touchdowns on 261 carries (5.3 average); 14 receptions for 107 yards (7.6 average); and even an 11-yard touchdown pass. He had midseason knee surgery and also was bothered by a hamstring injury, but Choice missed just one game last year. Choice was tremendously productive at the collegiate level when healthy. He is a proven workhorse with very good vision, toughness and power for his size. He displays good patience setting up blocks and he also is quicker to and through the hole than some think. Unfortunately, Choice doesn’t have the frame to match his hard-charging running style, which has led to several injuries throughout his career. In addition to concerns regarding his durability, Choice lacks ideal top-end speed and will never be a homerun threat as a runner, pass-catcher or kick returner in the NFL. With all that in mind, Choice projects as a solid backup in the NFL and should come off the board in the mid-round range of the 2008 draft. And it’s Tashard Choice from Georgia Tech. So the Cowboys take a second back, which makes my point that the choice of Choice (sorry) was necessitated by the drafting of Felix Jones. Rashard Mendenhall would’ve allowed the Cowboys to go in another direction here. But with Jones on board, they still needed insurance, since if Marion Barber goes down, there’s not enough of it with the Arkansas product. Calvin Watkins agrees, twisting the knife a bit. Cowboys got another backup running back in the draft. See Felix Jones. Anyway Choice rushed for 1,412 yards and 10 touchdowns on 261 carries for Georiga Tech last season. Choice battled a hamstring last season and missed one game due to knee surgery. The ESPN gang seems pleased with the pick. And, certainly, this is a good value for the slot.